Addon Description: this block can display 3 images from guildox.com using your predefined settings. them 3 images have different information about your guilds progress within world of warcraft. you can disable the world ranking from displaying and have it just show your realm ranking. all of the color values within the images can be changed to better fit your own themes and all of this is from a simple ACP menu. your guild a PVP guild but you want to display your battleground info ONLY? well thats possible as you can set it in the ACP to only display the images you require. having it that way will minimise the display abit and show just the info they want to show. 2. navigate to Extensions -> Portal -> Portal Modules and click "Add Module" for the Left OR Right Column and add "Guildox.com rankings". 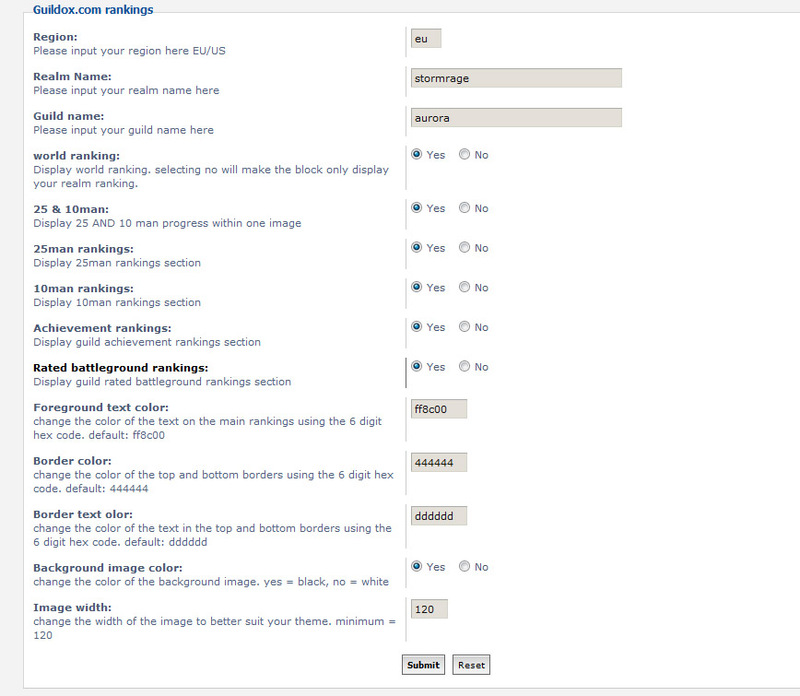 3. now configure your installed "Guildox.com rankings" module to your liking by clicking on the . Updated: now works with guildox's redesgined website. there is only 3 images available now as ranking are not ranked by group size anymore. composer.json missing in this or is this not for phpbb ? i think you might havr downloaded the french translation.